Cliff Kelley (CK): A lot of people are unaware of the fact that there's a lot more to Saviours' Day than the keynote address. It's a convention, with all kinds of activities and workshops. HMLF: We had great Plenary Sessions. We opened it with our book The Secret Relationship Between Blacks and Jews, and it was a Plenary Session with the erudite scholars of the Nation of Islam that did the fantastic research from the pens of Jewish scholars, historians and rabbis to write a history that we believe not only Black people should know, but White people should know as well; and many Jews who do not know what happened to Black people. 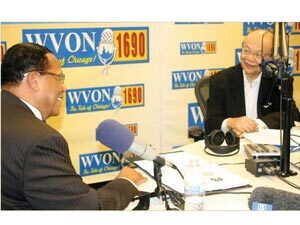 The book came into existence not because we were looking for “controversy.” The Muslims were so upset that every time my name was mentioned, it was mentioned that Farrakhan is an “anti-Semite.” And because of that charge leveled over the last 25 years continuously, many things that we could have done successfully were interfered with because of that label. So the scholars and historians in The Nation decided that they would make a serious study of Jewish history to see whether that charge of “anti-Semitism” could be dispelled by a profound book on the truth from their lips, their pens, and their scholarship. So when they say that it is “all lies,” it's “terrible,” it's because they are afraid of the truth that is in it, that is so clear; and 1,800 footnotes, which any scholar can go back and read the writings out of which this book was developed. And I humbly say that all of us as Black people, and Gentile Whites, and Asians and Hispanics: We have all read of the horror of the Holocaust. We know that something terrible happened under the Third Reich in Nazi Germany, and each of us reads it, hears it, sees documentaries on it; we have to know about it in all our classrooms so that this will never happen again, and no one will stand idly by on the sidelines while an entire ethnic or racial group is attacked. So, we wanted America and the world to know that if we could study their tragic history, why shouldn't the American people know, and why shouldn't Black people know how we got into this condition and position? CK: One of the things that I think you do, which I think is just great: You bring so many people together. When I was out in Rosemont at the venue for Saviours' Day, I saw so many people out there that I know aren't “Muslims”; and people of different colors. You mentioned the fact during your speech that there are a lot of Caucasian people that write to The Nation of Islam, asking for all kinds of information and so forth. Tell us about that. HMLF: Because The Enemy has tried to make the people think that we're behind closed doors, planning insurrection and rebellion against the government of the United States, and White people and Jewish people, we decided to webcast our Sunday broadcast all over the world so that if people wanted to listen to what we teach, they can tune in to www.noi.org, and really see what we teach. We are not planning any evil. In fact, when I was looking at the hearings that are going on in Washington, D.C. under the guidance of Peter King and Homeland Security, where they're talking about the “radicalization” of Muslims and terror groups. Well, The Nation of Islam has been here for 80 years and if anybody has a “beef,” it should be us! But you don't find Black people throwing things, killing people, bombing bridges, talking like that! And I want America to know: If we in The Nation of Islam found somebody trying to blow up a bridge that would kill innocent people, you wouldn't have to call Homeland Security—by the time they got to us, he would need some kind of security! We hate that kind of thing, the killing of innocent people “in the name of God or religion”! You may be angry, but how do you handle your anger, your frustration? This is where we live! This is where we breathe! These are the people that we live next to, and if we can't get along, there are ways that we can handle things. But to make bombs and kill innocent people? Heck no! No, The Followers of Elijah Muhammad will stop that wherever we see it! We won't just “report” it, but we'll stop the hand of those that we know would do anything like that, that would kill innocent men, women and children no matter what their color is! God is sufficient as The Avenger! So if it snowed like it did in Chicago on the 2nd of February, with winds blowing at 70 miles an hour, God didn't care whether you were “White” or “Black”—He dropped the snow on you! If you couldn't get out of your house, that's your problem; but it affected Black, it affected Brown, it affected Red, it affected Yellow; it affected rich, it affected poor, because that's the way God does! God is an “Equal Destroyer Opportunity Man”—so that's The One we need to be afraid of. Not somebody with a little bomb in their backpack! CK: I want to talk a little about this “radicalization” hearing. We know about Peter King's background, of course; he's there now because the Republicans took over the House, and he's the head of the Homeland Security. We've got radicals in all groups, not just Muslims. What is your opinion of what is the purpose of what this whole thing was about? HMLF: This hearing was very, very interesting because the great fear that is expressed is a fear that Muslims will begin to institute Sharia Law in the United States of America. Yes, we are Muslims; and if we just lived The Moral Code of Islam, a lot of people would find it difficult. Imagine a nation of people that don't smoke: What happens to the tobacco industry? A nation of people who don't drink: What happens to the liquor industry; and the people arrested for drunk driving? What happens to the dope dealers, and the dope industry when you've got people so clean that you could drop a mound of cocaine in front of the mosque, and the Believers would sweep it up, burn it, destroy it—never sell it—because we want for our brother what we want for ourselves! And since we don't want it for ourselves, why would we want that for any member of the Human Family? For instance: We do not display our women in a way that makes men lust after their beauty. When Allah says in the Qur'an to the woman, to lower the hems of your garment, and cover your bosom; and “do not display your adornments,” we, as men, don't have the adornment that the female has. A breast is adornment; and the beautiful shape of the rear end is [adornment], “good to look at,” so when you put that in a man's face, how can he think sanely? How can he think progressively? So the Muslim says, “No. Cover the woman.” It protects her, but it also protects the man from the aggressive nature that a man has toward a woman who is unclad. And so these kinds of Teachings would benefit the society! This kind of Way of Life would increase the life span of the American people; decrease accidents on the highway! Muslims are a blessing to America, and not a curse! However, when you have people who are so quote-unquote radicalized that they will strap a bomb on themselves because they're angry, and their grievances have not been addressed properly; then they wish to go out and harm innocent people. That kind of thing we have to speak against. And so I thought Peter King may have had some idea in mind, but, if you listen to (Congressional representative) Sheila Jackson Lee, if you listen to Danny Davis, if you listen to Congressman Keith Ellison, and you listen to people who are Muslims, they have nothing in their heart against the country in which they have been afforded an opportunity to become who they are, then they take umbrage at the fact. After 9/11 the F.B.I. moved on Muslims, this is a fact! They broke into the homes of some immigrant Muslims, took their computers and whatnot. Muslims after 9/11—I'm speaking more of immigrant Muslims—felt that they were under siege! And that's why CAIR said, “Don't talk to the F.B.I.” But under proper circumstances, why shouldn't you talk to the authorities if you have nothing to hide? Well, we never talked to the F.B.I., but, they followed us; they came to our homes, and they tried to frighten us out of Islam! They would go to our neighbors, and show our neighbors pictures of us as though we were “criminals.” And so the neighbors said, “My God! These Moslems—the F.B.I. came and left their card…” You know that the F.B.I. under J. Edgar Hoover targeted more than Muslims, they targeted Black leadership! Black groups! Nationalist groups! So, no: We didn't have any “good feeling” about the F.B.I.—why should we? But if you come with respect, you get respect, and that is what we teach! HMLF: Well, I'm sure they're moving gently and swiftly toward Louis Farrakhan and The Nation of Islam. We don't carry any weapons, but The Greatest Weapon that we have is in our mouth, and it is The Truth. When you speak Truth, and you're unafraid of the consequences of speaking the Truth, people that have lied and have built their house on lies, fear Truth! They don't fear guns because they have bigger guns! But a Lie is always afraid when Truth comes in the room. CK: Brother Minister, about Libya: France has now recognized a national transitional council; and then Secretary of State Hillary Clinton is saying that they are telling the Libyan Embassy to leave out of D.C. What is your opinion as to what is happening with Libya? HMLF: Muammar Gadhafi and the problem in Libya is much more complex than what the news is saying. Muammar Gadhafi has always been hated by Western, European, Neo-Colonial, Imperialistic governments. That man, Muammar Gadhafi, came to power in Libya not in a coup that killed people—it was a bloodless coup. And when he took power, America was there, Britain was there; they had bases there! They controlled the sweetest crude oil in the world from Libya. And if you notice, when you study the “Marines” song: “From the halls of Montezuma, to the shores of Tripoli, we will fight our country's battle on the land and on the sea!”—what were you doing in Montezuma? And, what were you doing in Tripoli? See, this attitude that somehow Western powers have a right to the resources of weaker nations in Africa, in Central and South America: Gadhafi rejected that notion. And, under Reagan's Administration, the media called him “the mad dog of the Middle East.” Well, what do you do with “mad” dogs? You kill them. I [have told the world] that in 1985 I had an Experience that the Honorable Elijah Muhammad said to me on that Wheel—you take it, or let it alone—that: “Reagan had met with his Joint Chiefs of Staff to plan a war.” He didn't tell me where the war was gonna take place, or who the war was planned against, but he told me to hold a Press Conference and make it known that I got it from him, Elijah Muhammad, on The Wheel. Well, I didn't know exactly where this war was, but I kept watching how things developed. And while I was on a World Tour, I was in Belize in Central America, and President Reagan came on the television announcing that “no Americans should go to Libya”; “no Americans should do business with Libya”—that's when it started! When I got to Africa, by the time I was in Ghana, it crystallized for me that it was Libya that America was going to war with. So when I got to Benin, I sent my family home; got on a Russian jet and flew to Tripoli to warn Brother Gadhafi of what America was planning to do. Dear listeners, look: Whatever you may think of him, most of our thinking of great Black men, or White men that “power” does not agree with, the media has always been used to destroy their image and their reputation. Now, nobody wants civil war—it is the bloodiest of all kinds of wars, because you are fighting your own brothers: You're fighting the people of your own language and culture and history. So, in every nation, brothers and sisters, there is dissatisfaction. And what the CIA does is go into a country and move among the people that are dissatisfied to stimulate a revolt against a leader that they don't like, because they want regime change. When George W. Bush was president, he said they wanted “regime change” in Iran, and in Korea. How do you get regime change, honest America? How do you do that? The Congress of the United States voted to spend $150 million to replace the government in Iran that America doesn't like, so they send their agents in to work among the dissatisfied. So when Iran had this election, and the people in Iran rose up: They have legitimate grievances, all right—but stimulated from the outside. So President Obama didn't want to put his foot into that cage lest somebody say “America inspired it,” because it was America's policy to destabilize that government. Well, what about Libya? How much money is being spent to arm the so-called rebels? They're dissatisfied, but what is their “dissatisfaction” about? Do they have jobs? Yes. Do they have food? Yes. Has Gadhafi used the oil money to build Libya? Yes. Did Gadhafi use oil money and discover water under the Sahara Desert, and brought that water to the surface; and brought water from Benghazi all the way, to the border, almost, of Tunisia? Did he impose farming in the Desert so that they could feed their own people? Yes. Are there billions of dollars that he's spending building homes, building apartments for his people? Yes … So something is under this! And so when America, England, France, three Imperialist Powers, want to destabilize that country, is it that you're “so concerned”? Listen to this Hypocrisy, American people! Is it that American government is “so concerned” over the blood that is being shed in Libya, but you looked the other way when the Israeli Defense Force was bombing the innocent people of Gaza, unarmed men, women and children? You looked the other way when the Israeli Defense Force went into Lebanon thinking that they were going to have an “easy” victory, then you had to come out with your tail between your legs? Don't tell me, and wise Black people or White people, that you're interested in Black suffering! Where were you in Rwanda? Where are you in The Congo? Why did you go to Darfur? Because oil is there! No … You don't want to “save” the Libyan people—that's your noble motive to hide your wicked agenda! What did you, American government, do in Waco? What did you do when your people rose up? Did you talk 'em out of it? NO! They had weapons; you bombed them! What did you do in Philadelphia with the MOVE movement? Did you talk them out of their home, or did you bomb them? We didn't hear any “outcry” from you religious hypocrites that “love” the lives of human beings! You're a liar! And a hypocrite! And I warn my brother, President Barack Obama: Don't you let these wicked demons move you in a direction that will absolutely ruin your future with your people in Africa and throughout the world! They don't like the way you handled (former Egyptian President Hosni) Mubarak! They don't like the way you're handling the situation in the Arab world! So I would advise you to be careful; and move with wisdom and skill.